Ladies Cotton Skirt. Sizes 10-24. Machine Wash. Length 27",30",33". A great material and style that I will get a lot of pleasure wearing both casual and dressed up. 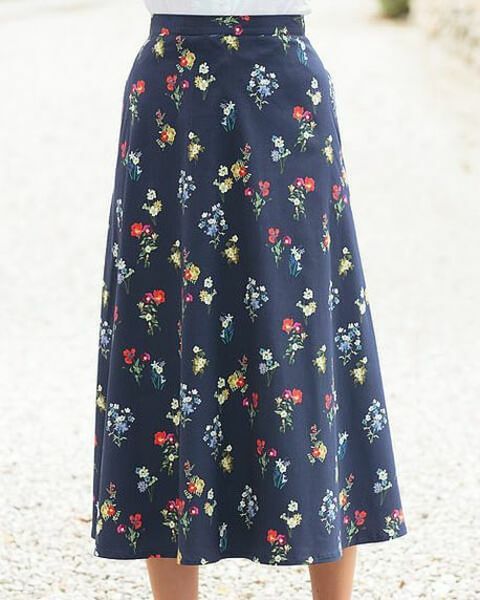 "A great material and style that I will get a lot of pleasure wearing b ..."
Attractive floral print Skirt in softly draping 98% cotton/2% elastane on a navy base. Swing skirt style featuring side waist elastication, centre back zip and button fastening with side seam pockets.